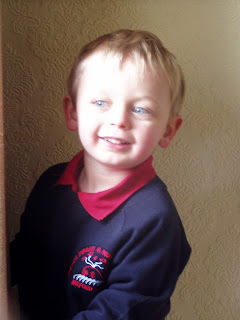 Littlest started part-time school on Monday and he has soooo enjoyed his week. A huge bundle of unwanted yarn from my generous Mum......there is loads of it ........ all different colours and types......where do I start! 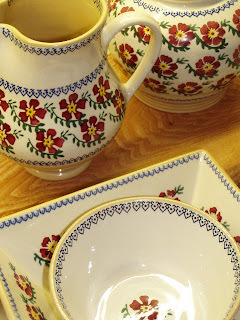 Some lovely new china, also from my Mum....this is Nicholas Mosse spongeware china.......so lovely! I am truly blessed with so much! I am ever cheerful and ever thankful! After much stress (me), pacing up and down with said pup and barfing (pup) (I wonder if barfing is a universal word)....like barking but with more substance (sorry, so wrong I know) Chester is literally half the dog he was last night....thank goodness indeed! Anyhoo......quickly moving on.......if you would like to see other people's reasons for being cheerful this week, please check out Planet Penny's post here......and why don't you join in to! First of all, 'littlest' is just too cute! But I also bet there is a littlest imp behind that cute face. :) Then, Oh! Bad puppy! He could end up looking like Boo if he is not careful. That would be so tragic. It is a very good thing that you didn't have any bags of Peanuts lying about. And last of all, I can't wait to see what you do with the Curly Wurly yarn. glad Chester is bettr and ur lil un had a good week at school too. 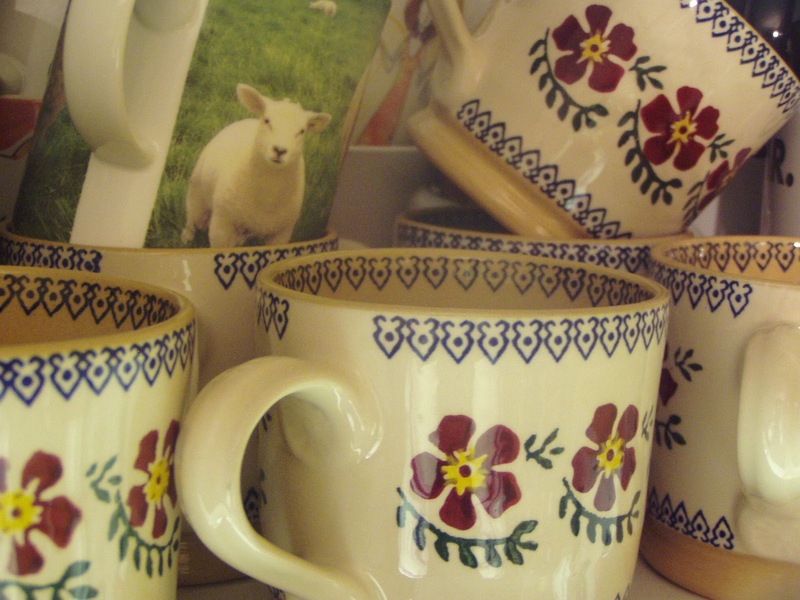 Great reasons to be cheerful, especially that fantastic china. 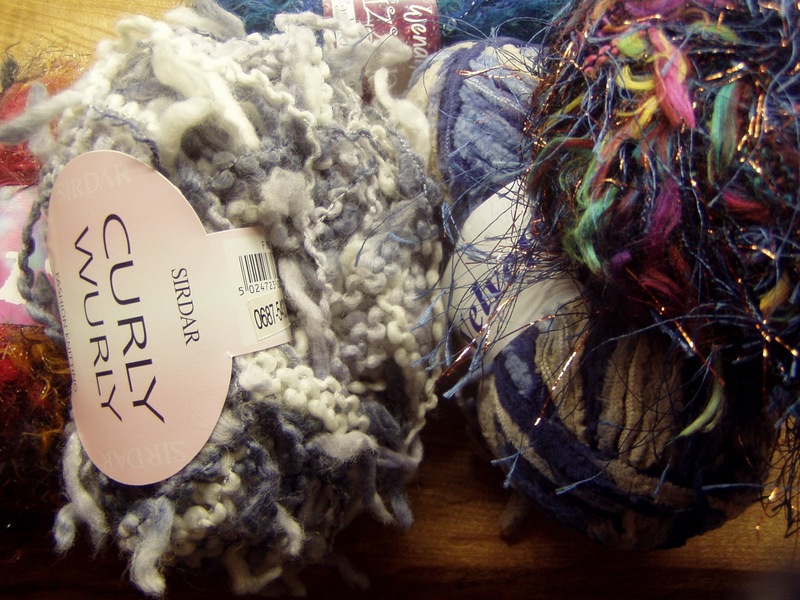 It is gorgeous, you are so lucky and that wool, what a great excuse for a new project! So glad that Chester is feeling and looking better. It so hard with animals to know what is wrong!!! Thank goodness he is back to his regular size ! and how good are yarn presents??? What a cheeky little grin, glad he had a good time. How fab are those pressies? I think I have a ball of the pretty sparkly one on the right. Thanks for joining in with Reasons to be Cheerful, yours have really made me smile! That's good news to hear about Chester being on the the mend Faith, can be a worrying time I know. 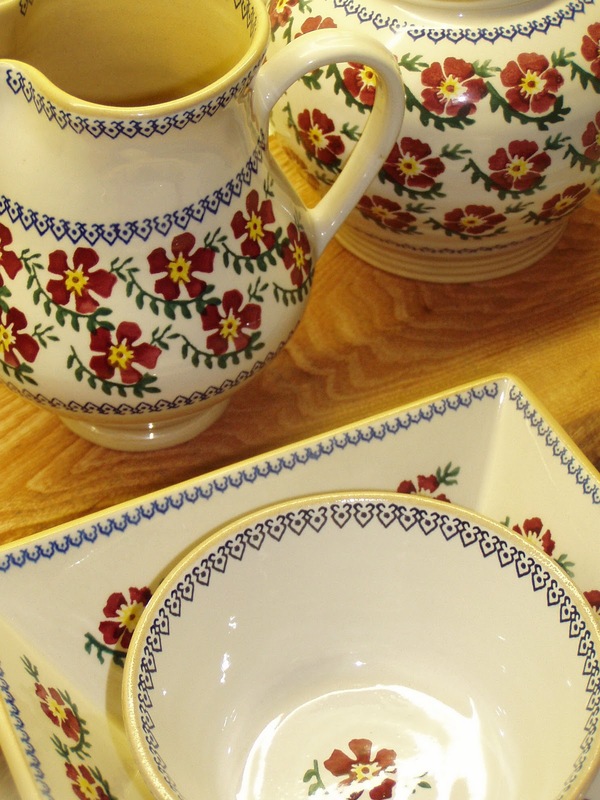 I can see why you are feeling cheerful about your beautiful china, it's so unusual and very beautiful indeed....lucky you! That's a beagle for you! I'd like to say it gets better but our dog is nearly 3 years old and if he is one of those moods and you turn your bag he still does cheeky things. We don't have a garden anymore. He dug up all the plants and ate them from the roots. Glad to hear that Chester is back to normal. How cute is your little one going to school, what luck with the yarn and tea set, love them both. Ooh I have a gorgeous chunky vase in that pattern, given to me by my 'besty' when we were still in Scotland. I always love using it. Glad Littlest enjoyed pre-school, I still get the occasional day when Robert has to be peeled off me, totally unlike his sibs! You'll be glad to have a couple of hours to yourself. We laugh at our dog, we adopted him when he was approx 7 so is very sedate most of the time, not sure I could have coped with a puppy, hope you don't have too many exciting dramas with Chester! What a sweet face on your littlest! And sorry about Chester's eating mishap - your description was just restrained enough to be funny!